Microsoft has announced some new features for Office Online, including work on Skype integration and a new Chrome browser extension. Office Online is about to get fully integrated Skype voice and video chatting, so whichever online app you're working in (Word, Excel, PowerPoint or OneNote), you can talk directly to your Skype contacts. As Microsoft notes in a blog post, this will help with seamless collaboration on documents and the like, as when you're jointly working on a file, you can quickly fire up a chat to have a discussion about any issues that crop up. Of course, instant messaging is supported as well, and the text of your messaging chat will stay connected to the document in question, so when you work on it at a later date, you'll be able to see that previous chat history. Skype integration will arrive in Office Online imminently – Microsoft says in November – and it will be coming to the desktop version of Office at some point, as well. 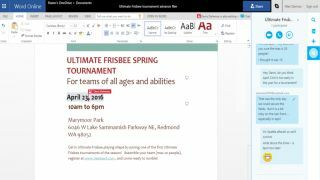 Microsoft has also introduced a Chrome extension for Office Online, so users can swiftly open or create documents within Google's browser. A number of small tweaks have also been made to Office Online, such as a revamped Navigation pane and formatting improvements in Excel Online. Redmond also said that it has introduced several enhancements for the Visual Basic Editor on Office 2016 for Mac, and that the Office on Android apps have been considerably streamlined, with the latest version having reduced the footprint of the software by some 40%.